"Bi-Color Styling with Talking Time and Alarm"
(Need Acrobat Reader to view PDF file? 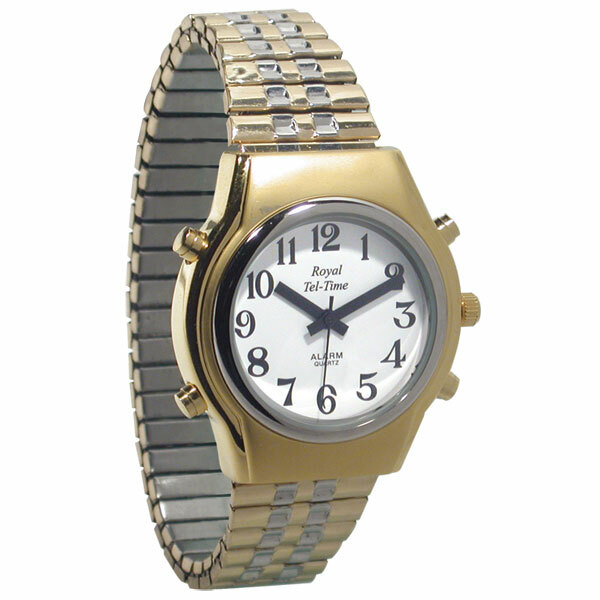 The only Classic Men's Bi-Color Quartz Talking Watch that has time and alarm announcement with clear male voice. Bi-Color Case Matte Finish w/White Dial and 1-12 Black Numbers- Bi-color Expansion Band. Features: hourly audio annoucement and alarm with 3 different sounds. Easy to maintain. Powered by 2 lithium batteries (included). Dial size 1-3/8" Diameter.